-from 5:30 to 8:30 p.m.
-at Harrisonburg High School (1001 Garbers Church Rd, Harrisonburg VA). This year, we are raising funds for various food-related projects: providing a dairy cow for nutritious meals for the girls, which requires a lean-to and supplies for caring for the animal; improvements to the water distribution system at the school; creating an opportunity for planting, maintaining, and harvesting beans, maize, and similar food items for the children; and more. Tickets ($35) include a bowl handmade from clay, wood, and similar food-safe materials by a local artisan, as well as a delicious soup meal donated by area restaurants. Tickets ($10) are available for a soup meal only. Children 5 and under have free entry: enjoying children’s activities, as well as a meal. A Silent Auction, T-shirt sales, and Maasai Market will be onsite that night. Purchase your tickets via the paypal link or the day of the event. For more information, contact Sarah Kohrs (senkohrs@gmail.com or 434-922-2029). LEVEL 2 – “Enkanyit” (Respect): $300 = Advertisements on social media and at event, as well as 4 tickets for dinner and bowls. LEVEL 3 – “Oloishiru Nkera” (Helper of the Children): $600 or more = sponsor advertisements on social media and at event, as well as reserved seating for 6 at a round table for your ticket holders. Your table is decorated and prominently displays your group’s name. Your group enjoys an insulated pitcher of chai, a cheese & fruit tray, an array of artisan bread, and cupcakes. Nasaruni benefitted from your generous donations of $14,500! That’s astronomical – thank you so much! A kitchen, connected to the dining hall, now provides meals for 130 students, teachers, and staff. Funds were also used to outfit the kitchen with boilers. There was enough left to purchase one dairy cow to contribute nutritious milk for the children’s chai. Thanks to your efforts, we raised over $9,000! Students of Nasaruni now eat their lentils & ugali sitting in a large dining hall! This is vital now that the dormitory is nearly full. Not only will it serve students and staff, but also the whole community. Parents will also participate through meetings and parent education nights focusing on the mission of Nasaruni, health, nutrition & hygiene instruction, and cultural presentations by the students. Follow up on Empty Bowls, 2016! 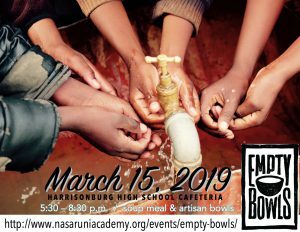 Students at Nasaruni Academy are thriving thanks to the generous efforts of potters, local restaurants, and many others at Empty Bowls, April, 2016! Proceeds about $4,500 were used to help drill and install the well in order to provide clean and constant drinking water source for the school! Thank you to all who came out to support us!